Bedrooms: Master bedroom has a king-size double bed, 2 twin-bedded rooms, of which one has its own terrace. Ceiling fans in the double bedrooms. Stand up fans in the twin bedroom Bathrooms: En suite shower room with master bedroom (shower, basin bidet, wc) . Second full family bathroom (bath with shower, basin, bidet and wc). Living room: Sofas, armchairs, dining table, seating for 6. TV with English channels inc. BBC, ITV, sports, films etc. CD player. 3 sets double doors. Patio with table/chairs. Kitchen: American kitchen: Fridge/freezer, oven, hob, microwave, dishwasher, washing machine. Air-Conditioning. 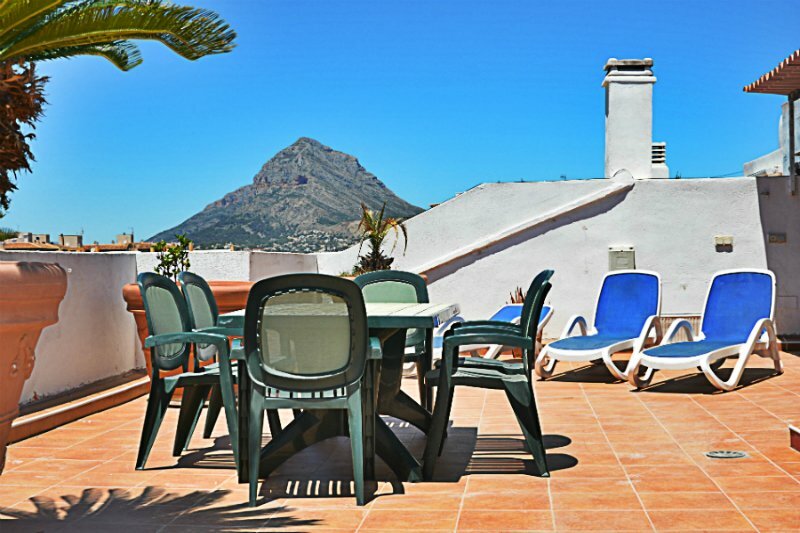 A car is not a necessary requirement for this property as it is located less than 300 meters from the main sandy beach of Javea and various supermarkets. The terrain is mostly flat with large, well maintained pavements and roads to all the local amenities. Javea also operates a very good and well priced bus system and timetable for getting about locally and accessing the Port or Old Town of Javea. However, it may be convenient to have a car for trips further afield or to other towns along the Costa Blanca.